A few turnips, a beet, some water, and a little salt. That's it. That's all you need for this really healthy and bursting-with-flavor recipe. The classic recipe (below) also includes a hot pepper and possible some onion, but I didn't want that in this one...I wanted the brightness of the vegetable itself. 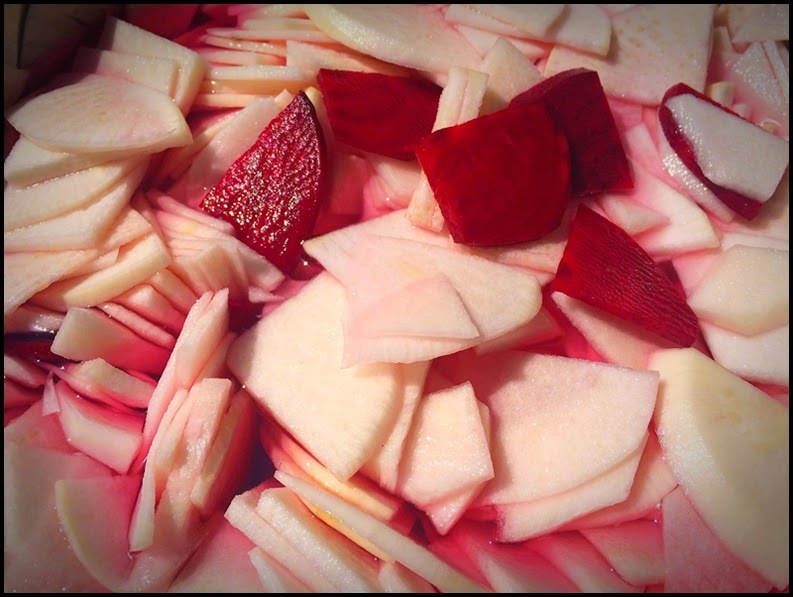 It's interesting in that as I was slicing the beets and turnip I was listening to The Splendid Table with Lynne Rossetto Kasper and one of her guests today was Maureen Abood, the Lebanese-American author discussing her new book of Lebanese food (it's also on my personal book list). Serendipity, I suppose. Anyhow, the image above is of the vegetables just added to the saltwater brine; they are not fermented yet. They were just added to the crock, and with warmer temps they should only take about a week to ferment. The single beet will color everything a lovely magenta; I'll post a pic of the finished recipe. Anyhow, if you would like more Lebanese-inspired recipes, click here; for more recipes that are fermented, click here; and if you would like to read an article on fermentation, click here. Combine the turnips, beets, onions, and jalapeno in a container that is wide enough to fit a few small plates. Press down on the vegetables with your hands to release some of their juices. Combine the water and salt in a bowl and pour over the vegetables. Weight the vegetables with plates; they should be completely covered in salt water. Cover and leave at room temperature. Small bubbles will appear within 2 or 3 days, after about a week or so it will begin to smell and taste distinctively sour. Depending on the temperature of your kitchen the turnip will take between one and three weeks to sour completely. Taste it as often as you like and when the flavor is to your liking transfer the container to the refrigerator to slow its fermentation.